We are a long established hair salon in Frenchs Forest. We cater for all your Family's hairdressing needs, may it be colouring your hair with latest colouring techniques, latest hair cuts and styling. Our staff are very experienced hairdressers who have been in the industry for a long time. We guarantee satisfaction with all our work because you are Worth it for us. We are open 6 days a week . Monday, Tuesday, Wednesday, & Fridays from 9 am to 5.30Pm Thursdays 9 am to 7.30Pm Saturdays 9 am to 4.30 Pm. There is Plenty of easy parking for you convince and no time limit as in shopping centres. WELCOME TO UNION JACKS! Providing professional, precise, tailored hairdressing services across the northern beaches, within your home comforts. During my 17 years in the Hairdressing industry I have gained numerous qualifications, worked alongside some inspirational hair stylists in varying environments. Originally from the south of England my training has been the very best, including teaching & assessing stylists of the future within a college environment. For me to maintain my high standards and current knowledge I also work at an upmarket salon in Sydney, where I used to manage a team of 7 before embarking on my own business UNION JACKS. I use and trust in a number of quality manufacturers such as Lloreal, Wella and Redken but can source alternative manufacturers if you have a specific requirement. 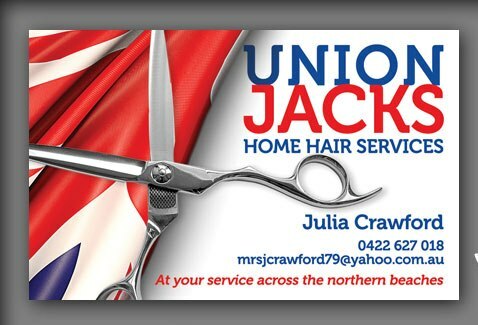 Many thanks for taking the time to consider UNION JACKS for your hairdressing needs. I hope I have the opportunity to serve you. I currently operate Wednesdays, Thursdays and Fridays between 8.30am - 5pm. (Limited evenings are available on request).